My work in empowering youth began when I was working with street children in Mumbai. I noticed many of them were creative and entrepreneurial in their means for survival, but none had a place they could save. These children weren’t offered a space in formal financial systems, which made the prospect of learning how to handle financial matters much more difficult and lessened their chances of becoming capable and confident adults later in life. This realisation is what fuelled my drive to make sure young people worldwide can be financially and socially equipped to build bright futures for themselves. Access to financial and social assets is a key contributing factor to help youth make their own economic decisions and escape poverty. Yet, despite this, a 2013 report estimated that less than 5% of youth have a savings account, as they face barriers to access financial services (UN). The global youth population continues to grow, with many struggling to make ends meet or living one pay check away from poverty. Now, more than ever, there is an imperative need for developing technology skills and financial acumen amongst the world’s most vulnerable. 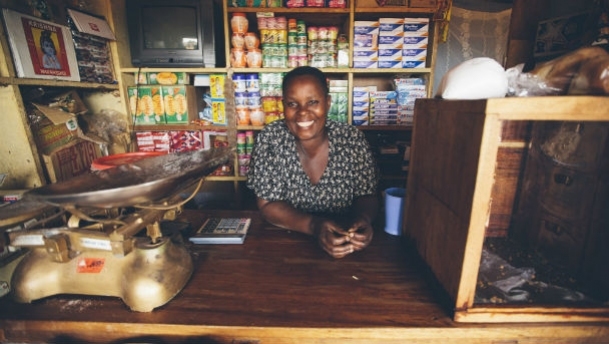 Although it is widely recognized that financial education and financial literacy are essential life skills for poverty reduction, youth are still being shortchanged when it comes to accessing the financial services they need to build assets, create sustainable livelihoods or become entrepreneurs. Progress has been made through initiatives to support youth access to finance, such as UNCDF-YouthStart and the YouthSave consortium working in countries across Africa, Asia and Latin America, but largely financial service providers have neglected youth and their needs. At Child and Youth Finance International (CYFI), we’re working with over 13000 organizations in 132 countries to ensure there is cross-sector collaboration in providing young people with the services and support they need to become confident, capable adults. Adopting a cooperative approach to tackling poverty-related issues facing children and youth, CYFI works with a global network – ranging from government bodies to corporate companies, groups of active youth to financial institutions – to offer young people opportunities and options for their financial futures. As part of our mission to transform the experiences of young people, CYFI are currently part of a leading working group dedicated to making money simple, safe and secure for young people everywhere. CYFI have collaborated with leading financial service providers, including Mastercard, ParentPay/Nimbl, Osper, and Mirador Digital to produce a set of child and youth-friendly product guidelines for the private sector. Building on the OECD/INFE Guidelines for Private and Not-for-Profit Stakeholders in Financial Education and UNICEF, the UN Global Compact and Save the Children’s, “Children’s Rights and Business Principles”, the guidelines provide a framework for businesses and financial service providers to ‘understand and improve the impact and diversity that they have on children and youth’s rights and well-being’. The guidelines introduce financial service providers to some important aspects to building secure, thoughtful child and youth friendly products. In supporting the development of products for youth, the working group also explores the power of innovation and financial technology as an up-and-coming driver of financial inclusion. Cell phone ownership has grown exponentially in recent years, and mobile banking offers a convenient way to be included in financial systems. Worldwide, young people are more tech-savvy and digitally included than ever before, yet many lack the much needed financial know-how to make wise decisions about money later in life. The fast-growing world of financial technology offers many opportunities; building the tools needed to successfully include children and youth in banking services, the chance to gain expertise from the private sector, and the impetus to create regulations around the financial needs of youth. An example of this is in Uganda, where the Private Education Development Network (PEDN) have collaborated with Oratec Ltd a software development company to create an automated school deposit and withdrawal management information system (e-banking) to promote savings amongst school students. Offering the opportunity for kids to understand how e-banking works by opening and managing their own account, the system also enables financial service providers to equip students with banking skills and fund financial inclusion through mobile money initiatives Fintech provides unprecedented opportunities for ensuring financial inclusion for youth and minority communities – making products and services more accessible, functional and affordable than ever, it’s no surprise mobile banking is creating such a buzz in the world of finance. In addition to the desire to economically empower children and youth to create positive social impact, there is a significant business case for financial service providers and private sector stakeholders to make financial products inclusive of youngsters. CYFI’s sister organization, Aflatoun, offers social and financial programmes to help young people learn to save for the future. In 2014, they supported over 2.6 million children and youth in saving a reported average of €2.23 per month. If it is assumed that over 90% of youth remain unbanked worldwide, this could represent around €2 billion per month in uncaptured savings and illustrates the potential value of youth as a client base. With young people representing a large, untapped market, companies and financial service providers can endeavor to create products which financially include them from an early age, potentially secure their loyalty for later in life, and create cross-selling to their families and communities. By financially including children and youth, service providers can ensure they are reaching the next generation of customers and consumers. If all unbanked youth worldwide had access to quality financial services and economic education, those living in emerging and developing economies would be provided with the financial acumen to build a better life for themselves. The creation of partnerships and working groups around the financial inclusion of youth provides both philanthropic and profitable incentives for those involved. The creation of child and youth-friendly products, services and protocol serves a positive social impact for young people (particularly those from low-income or minority communities) but also enables private sector representatives and financial service providers to contribute to poverty eradication without sacrificing growth. These collaborations highlight the opportunity for investing in sustainable development as a result of joint actions and expertise. By working together we can make sure that today’s children and youth are equipped with the tools and knowledge they need to become the next generation of empowered, capable citizens. Jeroo Billimoria is a pioneering social entrepreneur and the founder of several award-winning international NGOs. Her innovative approach to managing social ventures and bringing them to global scale has earned her fellowships with Ashoka: Innovators for the Public, the Skoll Foundation and the Schwab Foundation for Social Entrepreneurship. Billimoria founded Child and Youth Finance International in 2011.